July 27, 2012 By Denny Hansen & filed under All Articles, Rifles & Carbines, Weapons. Overall, the 5.56x45mm NATO/.223 Remington round used in the AR platform is sufficient for general use by our military, law enforcement and private citizens. Sometimes, however, a bit more power and/or range is required. For the military, this may mean engaging the enemy beyond the effective range of the 5.56. Law enforcement may have the need to penetrate an intermediate barrier such as glass that would be defeated by the .223. For the private citizen, who neither needs to engage an enemy at long range nor defeat barriers, the most common use for a more powerful, longer-range cartridge is probably hunting. That next step up in power for most people is more often than not the 7.62x51mm NATO, commonly known as the .308 Winchester. And the weapon system of choice for many is one based on the AR-15. Advantages for all three user groups are the familiar handling characteristics, as well as the increase in range and power. For the military user, there is an additional benefit. The enemy cannot tell that there is a long-range weapon among the troops—the .308 being indistinguishable from other ARs at a distance—thereby marking a designated marksman as a prime target. Right side of lower receiver showing ambidextrous magazine release and built-in receptacle for QD sling mount. While “stretching” the receiver to accommodate the longer .308 round is nothing new, the rifles currently made are lighter and more accurate than those in the past due to newer manufacturing techniques and materials. A few examples include Knight’s Armament Co. M110 SASS, the LaRue PredatAR (BATTLE RIFLE REALIZED: LaRue Tactical PredatAR, June 2012 S.W.A.T.) 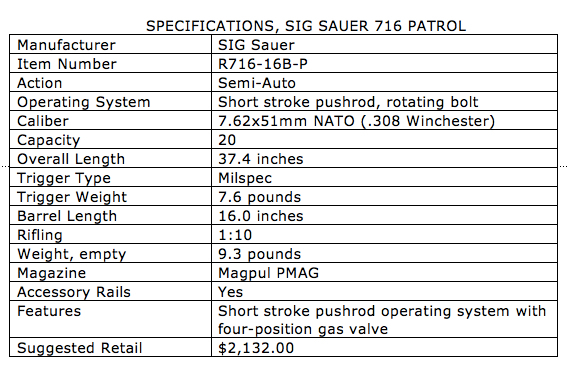 and the subject of this article, SIG Sauer’s SIG716 Patrol Rifle. The SIG716 Patrol utilizes SIG’s short-stroke pushrod operating system, which some feel is more efficient than the direct impingement design. 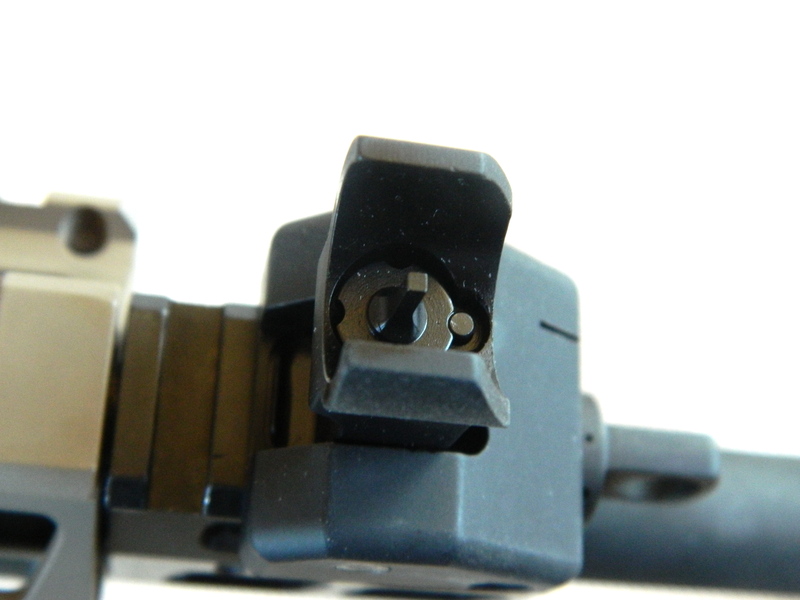 Rear sight is adjustable for windage. Overall length of the 716 with the Magpul six-position ACS stock fully extended is 37.4 inches, and unloaded weight is 9.3 pounds. The pistol grip used is the Magpul MIAD. The 716 Patrol has a 16-inch barrel with a 1:10 twist that is capped with an A2-type flash suppressor. The barrel is free floated and housed by an aluminum quad rail forend. The test 716 was one of the first finished in Flat Dark Earth. The upper and lower receivers, quad rail, pistol grip and stock are a perfect color match. Other parts—including takedown pins, trigger, safety, magazine release, dust cover, forward assist and charging handles—are black. The contrast is not only functional but also aesthetically pleasing. 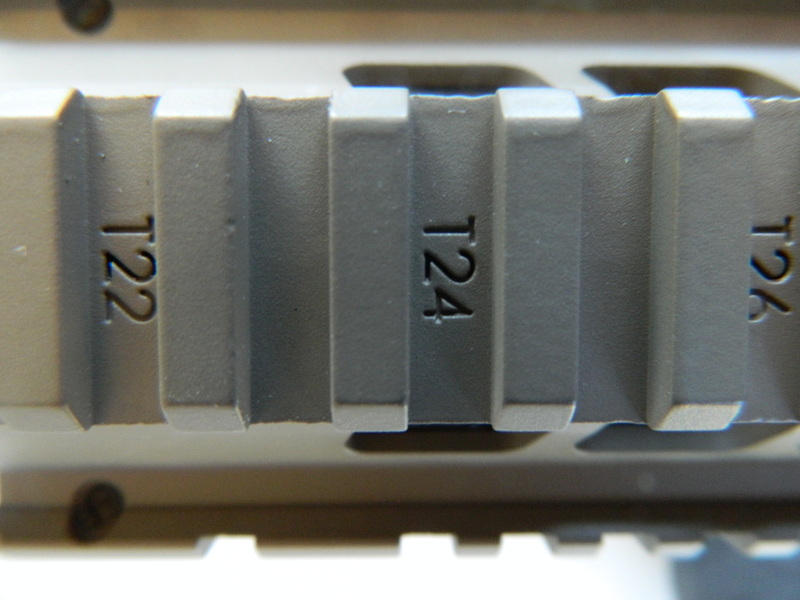 Rail positions are “T” marked, but the markings on the upper receiver, at least on the test rifle, can barely be seen, probably filled in by the coating process. But the marks on the quad rail are deeply engraved, ensuring they will be visible for the life of the rifle. On the rail at 1, 5, 7 and 11 o’clock are seven polygon-shaped openings that are large enough to effectively help release heat from the barrel. Elevation adjustments to front sight are made in usual manner. 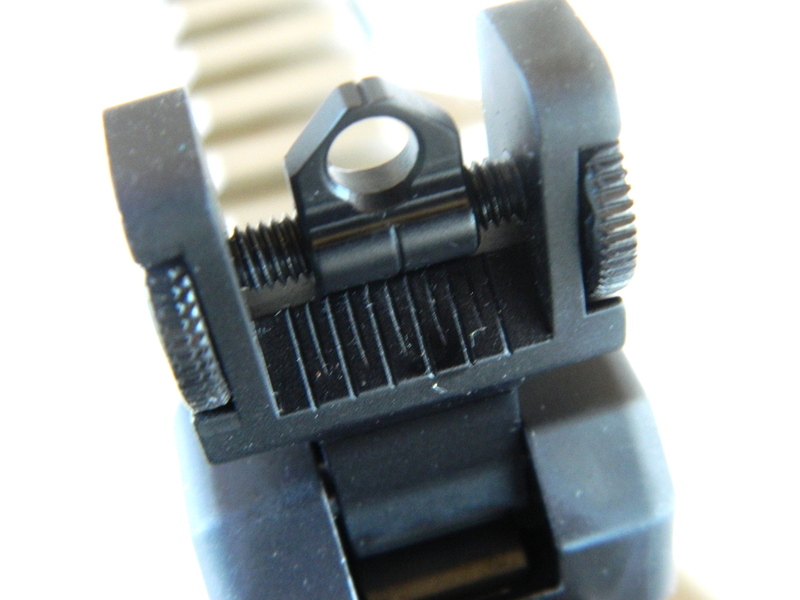 There are seven sling attachment points on the SIG716 Patrol that use QD socket type attachments. Two are on each side of the rail, one on each side of the lower receiver, and one is reversible for right/left hand use at the end of the Magpul ACS stock. 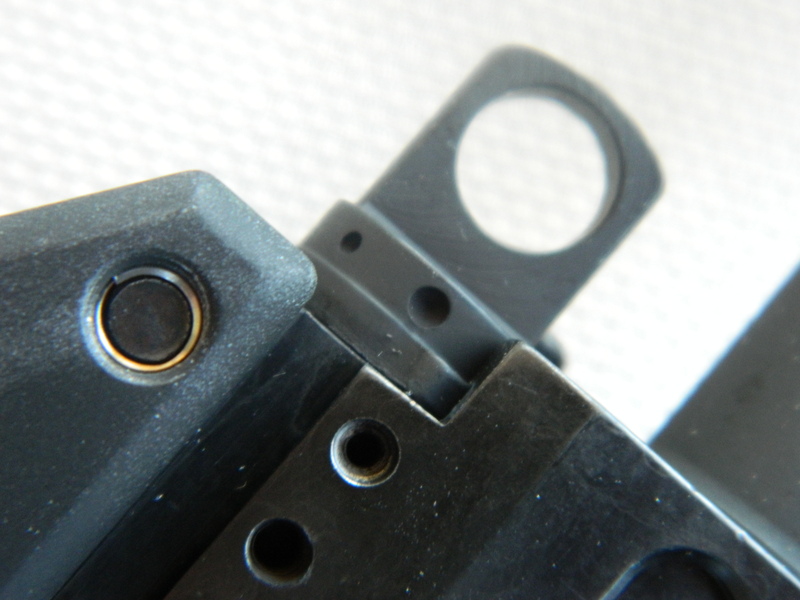 Both the front and rear sight fold down when not being used. The rear is adjustable for windage, while the front sight is adjustable for elevation. The magazine release, but not the safety, is ambidextrous. The front of the magazine well is grooved for a sure grip if the support hand is used to hold the rifle by the magazine well. 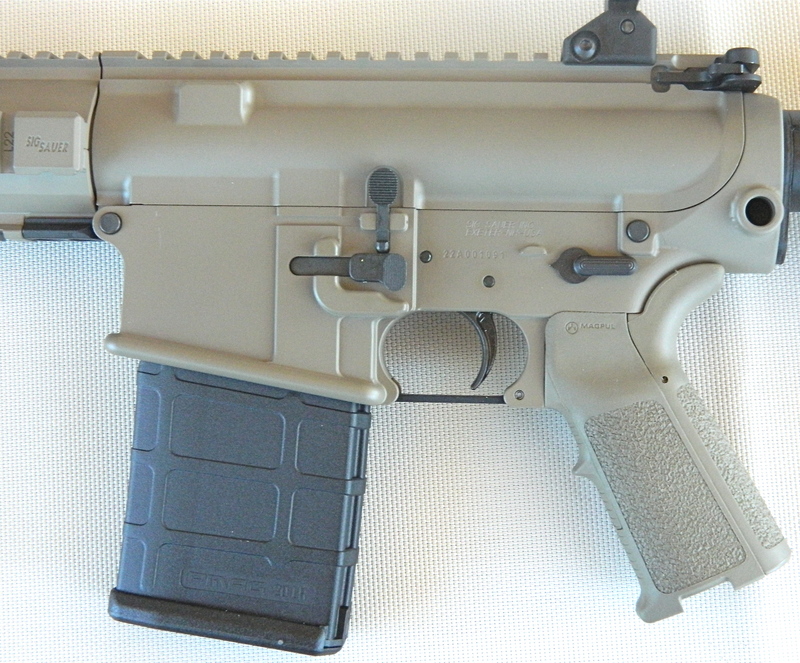 For the magazine, SIG again went to Magpul, and the SIG716 Patrol uses the PMAG 20LR. This magazine features a true 20-round capacity and a constant-curve body to ensure reliability. The PMAG 20LR is less than half the weight of comparable steel magazines. 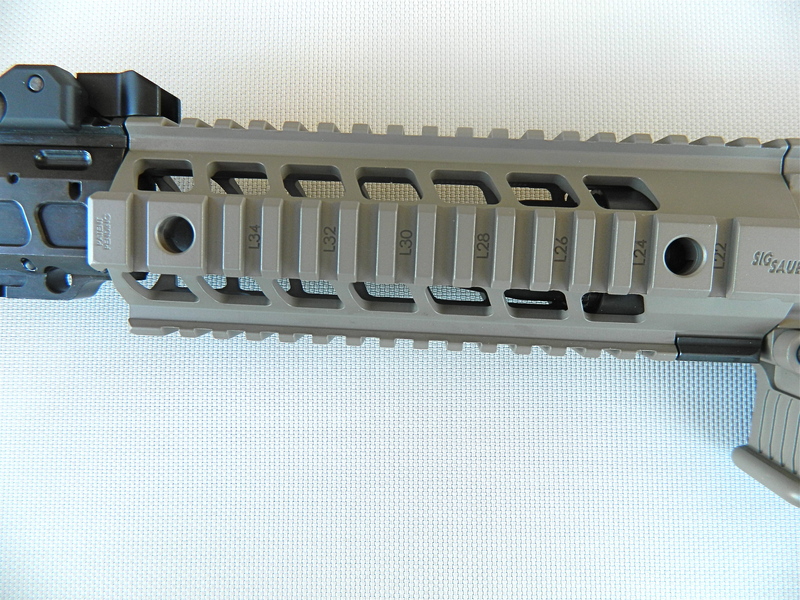 SIG716 has two QD sling receptacles on each side of the rail, one at each side at the end of the lower receiver, and one that is reversible from left to right at the end of the stock. 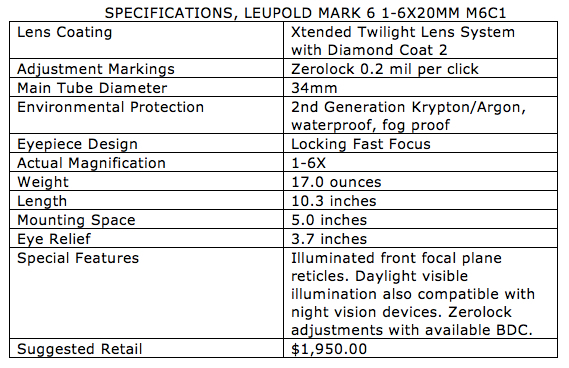 For optics on the SIG716 Patrol, I went with Leupold’s new Mark 6™ 1-6X20mm M6C1 scope. At 1X the scope has a field of view of 106 feet, making it suitable for CQB, while at higher powers it allows long-range engagement. Reticle options include the Close Mid-Range Reticle with Wind Holds (CMR-W) 7.62 and CMR-W 5.56, which enable both speed and long-range precision for shooters using 5.56 and 7.62 carbines, Designated Marksman or patrol rifles. For testing the SIG716 Patrol, of course the CMR-W 7.62 reticle was used. The Mark 6 1-6x20mm features illuminated front focal plane reticles that are visible in daylight and allow for accurate ranging and shot correction at any magnification and in various light conditions. There are seven brightness settings, and the scope is compatible with night vision devices. An “off” position between each setting helps extend battery life while easily returning to the preferred setting quickly. The matte black main tube is 34mm in diameter and provides more than 37 milliradians of total adjustment. Adjustments are 0.2 mil-per-click and offer very precise adjustments. Rail positions are not only marked, but also deeply engraved, ensuring they will always be visible. SIG makes no claims that the 716 is a precision rifle—it is a patrol rifle that can engage at longer range with more power than a 5.56mm carbine. As such it does not have the same crisp trigger that is found on a precision piece. The trigger is milspec, and SIG claims the weight to be around 7.5 pounds. Using an RCBS trigger-pull scale, the trigger on the test rifle broke at a hair over eight pounds. While I usually test carbines from field positions without a bench or bipod, since the SIG716’s mission is to be used at longer ranges, I installed TangoDown’s superb Advanced Combat Bipod to the rail to offer more stability and take as much human error as possible out of the equation. I fired the SIG716 Patrol with the three .308 Winchester Match loads I had on hand at the time of the evaluation, all boat-tail hollow points: Black Hills Ammunition 175-grain, Federal 168-grain Sierra, and Winchester’s 168-grain Nosler. Firing from 100 yards off the bipod, the best ten-round groups were obtained with the Federal match measuring 1.12 inches, followed closely by the Black Hills load at 1.25 inches. Gas regulator selector in normal position. Inexplicably, the best ten-round group with the Winchester load was 2.76 inches. Ammunition from the same lot shoots very accurately in both a Ruger Gunsite Scout Rifle and Savage M110, and so I have no explanation for the Winchester load’s poor performance in the SIG716. I will say, however, that I have seen shotguns from the same manufacturer—and with consecutive serial numbers—prefer one brand of buckshot or slug, while another patterns better with a different brand. And while this is common with shotguns, it can also occur to one degree or another with rifles. In total, I fired about 400 rounds from the SIG716 Patrol over the course of two weekends. Though that is admittedly a small number from a single sample of rifles, one of those days had spring temperatures hovering around 70 degrees, while another had temps in the low 20s with snow. 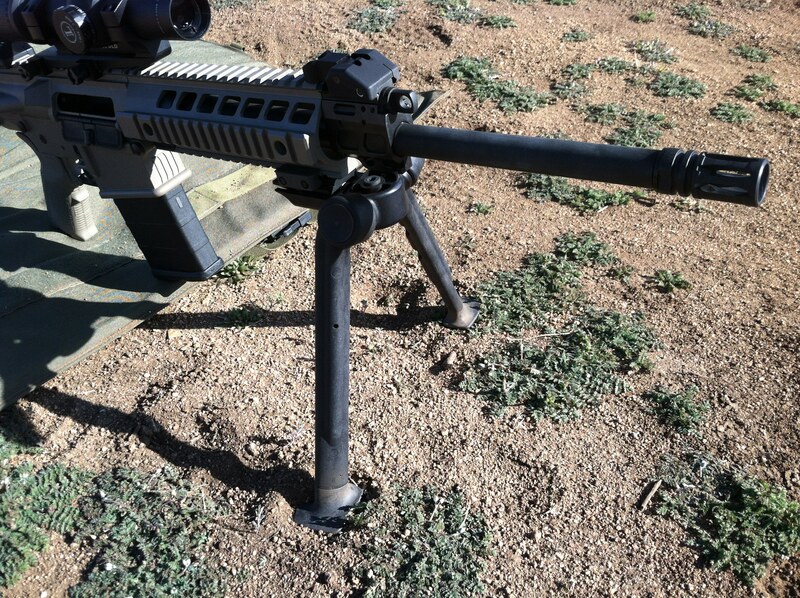 For accuracy testing, TangoDown’s Advanced Combat Bipod was mounted on 716’s rail. I experienced no malfunctions on the warm day, but more importantly, on the cold day, even though the ammo was in a GI ammo can in the back of the truck and was very cold, the SIG716 functioned perfectly with the gas regulator set at Position #1 (normal). As I said at the beginning of this article, there are times when a 5.56mm carbine is not up to the task at hand. That’s when a heavy hitter like the SIG716 Patrol Rifle really comes into its own.